Chronic lymphedema can be managed effectively using a sequenced and targeted treatment program based on decongestive lymphatic therapy (DLT) with compression therapy and surgery (mostly as an adjunct to DLT). In the maintenance phase, DLT is carried out using the proper combination of compression garments, meticulous personal hygiene and skin care, self-massage based on the principle of manual lymphatic drainage (if applicable), and exercises and activities to promote lymph transport. Pneumatic compression devices and therapy can be applied at home, if desired. When conservative treatment based on DLT fails or delivers suboptimal outcomes, the patient may need additional surgical interventions, either reconstructive or ablative, where applicable. These two surgical therapies are more effective in terms of outcomes when combined postoperatively with manual lymphatic drainage–based DLT. A long-term commitment to postoperative DLT, especially compression therapy, is a critical factor in determining the success of either reconstructive or palliative surgery. Recently, several causal genetic mutations have been identified among primary lymphedema syndromes, which provide possible opportunities for future molecular interventions. This new prospect of gene-oriented management is more promising as a molecular therapy for both primary and acquired lymphedema. Table I. Guidelines of the American Venous Forum on surgical treatment of chronic Lymphedema. of the American Venous Forum. 3rd Edition. London, UK: Hodder Arnold; 2009:663. A lymphovenous bypass that drains into the venous circulation can be performed by anastomosing functioning lymphatic vessels located within a diseased area to the regional veins.21 A lymphatic-lymphatic bypass can also be done using an interposition graft to connect to healthy lymphatic channels beyond the affected region using a transplanted lymphatic vessel or vein.22 Among these three different types of lymphatic reconstructions, developed based on microsurgical and supermicrosurgical techniques, lymphovenous bypass and anastomosis have remained the most popular approach for decades.23-26 For many reasons, the interest in this logical approach that offers a chance of a “cure” have waxed and waned over the years. In particular, the technically demanding microsurgical techniques have hampered the widespread acceptance of this approach as a first-line treatment, meaning that this noble approach remained available only at specialized centers to provide an active lymphatic surgical reconstruction. Recently, the new concept of “supermicrosurgery” rekindled the enthusiasm for lymphatic reconstructions with microsurgical and supermicrosurgical techniques.23-26 The popularity of lymphovenous or lymphaticovenular bypass and anastomosis has improved in recent years.14,27-29 In addition, the newly developed technique of vascularized lymph node transfer and transplantation (VLNT) as a free flap was a welcomed new approach with a more promising future,30-33 especially for the candidates who failed to meet the indication for conventional anastomotic reconstruction. Together with lymphaticovenular anastomosis, VLNT is the most commonly practiced procedure today. Nevertheless, the majority of the data that is available for thorough review belong to grade 2B or 2C when assessed using the system developed by Guyatt et al, and, at best, only a small number belong to grade 1C or 2A because of the unique condition of observational studies, as discussed in Part 1 (1. Introduction:1-1. Background) (Table 140). Early stage lymphedema is an ideal period for reconstructive surgery and unnecessarily delaying surgical intervention for more than 1 year will definitely allow further damage of the lymphatic vessel, especially its contractibility, and increase the risk of surgical failure. Therefore, the timing of lymphatic reconstruction is crucial and this waiting period should be shortened whenever possible to avoid permanent damage of the lymphatic vessels, thus making lymphatic reconstruction futile.1,2 In general, advanced stages of chronic lymphedema will show a poor response, with the poorest candidate for reconstruction being primary lymphedema caused by hypoplasia or aplasia of the lymph vessels with lymphatic fibrosis. Figure 3. Clinical case of lymphovenous anastomosis. preoperative lymphoscintigraphic findings showing diffuse dermal backflow to confirm advanced lymphatic dysfunction. Panel F.
Figure 4. Lympho-lymphatic bypass surgery. lymphedema. Panel B. Cross-femoral lymph vessel transposition for unilateral lower extremity lymphedema. end-to-side anastomosis using the same technique. Figure 6. Lymph node-to-venous anastomosis. lymph nodes directly to the vein segment to establish a microsurgical technique. VLNT is a way to make a bridge across the lymphatic obstruction for postmastectomy lymphedema, eg, by transferring lymph nodes harvested as a free flap from the groin by the anastomoses of the feeding artery and the draining vein to the appropriate vessels in the axillary fossa using standard microsurgical techniques.32,63 Donor sites to harvest lymph nodes for a free transfer include the superficial groin, supraclavicular, submental, thoracic, and omental groups. VLNT can improve both lymphatic drainage and regional immunological function and resistance to infection. VLNT becomes the source of vascular endothelial growth factor C (VEGF-C) and other cytokines that induce and regulate lymphangiogenesis.65,66 Increasing evidence shows that VLNT reverses the disease process to obviate the need for a lifelong commitment to DLT, etc.62 VLNT is now one of the two most popular microsurgical procedures to deliver improved lymphatic function successfully together with lymphaticovenular anastomosis as a reconstructive surgical modality. However, VLNT has been focusing on reducing the fluid volume of the lymphedema and failed to encounter existing fat hypertrophy and tissue fibrosis; the tissue damage that has already developed cannot be reversed completely. Figure 7. Clinical case of vascularized lymph node transplantation. for a free graft. Panel B. Actual operative field for the lymph node harvest with intact arteries and veins for a free graft. Panel C.
End-to-end anastomoses of donor and recipient arteries and veins. Panel D. Preoperative status of lymphedema. Panel E.
new lymph nodes appearing in the left axilla to confirm the successful vascularized lymph node transplantation. Often, a highly disfigured swollen limb would not allow proper wrapping with a bandage to deliver effective compression to the local tissue. Subsequently, the condition would continue to progress to become irreversible with an increasing risk of local and systemic sepsis in the majority. Excisional surgery is a viable option to play a new supplemental role in the non- to poor-responding DLT group. As adjunctive therapy, it would improve the efficacy of DLT on the treatment of intractable end-stage lymphedema. Surgery and DLT have mutually complementary effects. Nevertheless, there is no consensus yet on the optimal timing of the intervention or the choice of procedure. Liposuction is a method to remove fat, not fluid, meaning that it should not be performed before DLT is used to transform pitting edema, which is caused by accumulated lymph, into nonpitting edema. Percutaneous liposuction removes excessive adipose tissue along with cannulas attached to vacuum suction during the adipofibrous (mid) stage (clinical stage II and III). Therefore, the patient who gets the most benefit from this procedure is the one who developed a unique condition of excess fat accumulation as a manifestation of the secondary lymphedema of the upper limb following breast cancer treatment.74,79 In addition, the control of the hydrostatic component of lymphedema should be done with conventional DLT before and after the liposuction. Figure 8. Clinical case of a bilateral excisional and debulking surgery of the lower extremities. excisional surgery to make the local condition amenable to effective decongestive lymphatic therapy for better rehabilitation. surgery on both lower extremities. A new concept of surgical reconstruction of lymph vessels and lymph nodes has been rapidly evolving throughout the last 50 years and various modalities of microsurgical lymphatic reconstructions were introduced based on anastomotic reconstruction of lymph vessels to veins and lymph nodes to veins in addition to lymphatic grafting to bypass the lymphatic obstructions. 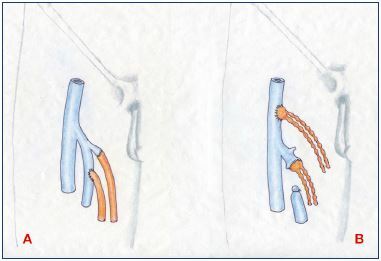 Among these three different types of lymphatic reconstructions, developed based on microsurgical techniques, lymphovenous bypass/ anastomosis has remained the most popular approach for decades. So far, reconstructive surgery with various microsurgical lymphovenous anastomoses can deliver the best outcome when performed in patients at clinical stages I and II (early stages) before the progression to the advanced fatty fibrous stages. Reconstructive surgery with autologous free lymph node transplant surgery also provides a promising future for primary lymphedema in clinical stages II and III with defective lymph nodes, which is known as lymphadeno-dysplasia in particular. Reductive surgical approaches are one of two surgical options together with physiologic approaches, performed alone or together. Reductive approaches aim to decrease the morbidity caused by excess volume of the affected limb either by removing the fibrofatty tissue with direct excision methods or liposuction. Excisional surgery is a viable option to play a new supplemental role in the non- to poor-responding DLT group; as adjunctive therapy, it would improve the efficacy of DLT on the treatment of intractable lymphedema in the end stages. Surgery and DLT have mutually complementary effects. However, there is no consensus yet on either the optimal timing of the interventions or the choice of procedure. Liposuction is an additional debulking technique that is a less radical approach than excisional surgery. The aim of liposuction is to obliterate the epifascial compartment by “circumferential” suction-assisted lipectomy, instead of resecting the entire fibrosclerotic soft tissue overgrowth. Therefore, it can avoid the complications and morbidity associated with the traditional open surgical method with excisional technique. 1. Lee BB, Andrade M, Bergan J, et al; IUP. Diagnosis and treatment of primary lymphedema. Int Angiol. 2010;29(5):454- 470. 2. Lee BB, Andrade M, Antignani PL, et al; IUP. Diagnosis and treatment of primary lymphedema. Int Angiol. 2013;32(6):541- 574. 3. Lee BB, Kim DI, Whang JH, Lee KW. Contemporary issues in management of chronic lymphedema – personal reflection on an experience with 1065 patients. Commentary. Lymphology. 2005;38:28-31. 4. Lee BB. Contemporary issues in management of chronic lymphedema: personal reflection on an experience with 1065 patients. Lymphology. 2005;38(1):28-31. 5. Campisi C, Bellini C, Campisi C, Accogli S, Bonioli E, Boccardo F. Microsurgery for lymphedema: clinical research and long-term results. Microsurgery. 2010;30(4):256-260. 6. Campisi C, Eretta C, Pertile D, et al. Microsurgery for treatment of peripheral lymphedema: long-term outcome and future perspectives. Microsurgery. 2007;27(4):333-338. 7. Lee BB. Surgical management of lymphedema. In: Tredbar LL, Morgan CL, Lee BB, Simonian SJ, Blondeau B, eds. Lymphedema: Diagnosis and Treatment. London, UK: Springer; 2008:55-63. 8. Lee BB, Laredo J, Neville R. Reconstructive surgery for chronic lymphedema: a viable option, but. Vascular. 2011;19(4):195- 205. 9. Gilbert A, O’Brien BM, Vorrath JW, Sykes PJ. Lymphaticovenous anastomosis by microvascular technique. Br J Plast Surg. 1976;29(4):355-360. 10. Gloviczki P, Hollier LH, Nora FE, Kaye MP. The natural history of microsurgical lymphovenous anastomoses: an experimental study. J Vasc Surg. 1986;4(2):148-156. 11. Gloviczki P, Fisher J, Hollier LH, Pairolero PC, Schirger A, Wahner HW. Microsurgical lymphovenous anastomosis for treatment of lymphedema: a critical review. J Vasc Surg. 1988;7(5):647-652. 12. Campisi C, Boccardo F, Zilli A, Macciò A, Napoli F. Long-term results after lymphatic-venous anastomoses for the treatment of obstructive lymphedema. Microsurgery. 2001;21(4):135-139. 13. Olszewski WL. The treatment of lymphedema of the extremities with microsurgical lympho-venous anastomoses. Int Angiol. 1988;7(4):312- 321. 14. Olszewski WL. Lymphovenous microsurgical shunts in treatment of lymphedema of lower limbs: a 45- year experience of one surgeon/ one center. Eur J Vasc Endovasc Surg. 2013;45(3):282-290. 15. Nielubowicz J, Olszewski W. Surgical lymphaticovenous shunts in patients with secondary lymphoedema. Br J Surg. 1968;55(6):440-442. 16. Jamal S. Lymph nodo-venous shunt in the treatment of protein losing enteropathy and lymphedema of leg and scrotum. Lymphology. 2007;40(1):47-48. 17. Baumeister RGH, Seifert J. Microsurgical lymphvessel-transplantation for the treatment of lymphedema: experimental and first clinical experiences. Lymphology. 1981;14(2):90. 18. Baumeister RG, Siuda S. Treatment of lymphedemas by microsurgical lymphatic grafting: what is proved? Plast Reconstr Surg. 1990;85(1):64-74. 19. Weiss M, Baumeister RG, Hahn K. Dynamic lymph flow imaging in patients with oedema of the lower limb for evaluation of the functional outcome after autologous lymph vessel transplantation: an 8-year follow-up study. Eur J Nucl Med Mol Imaging. 2003;30(2):202-206. 20.Baumeister RG, Mayo W, Notohamiprodjo M, Wallmichrath J, Springer S, Frick A. Microsurgical lymphatic vessel transplantation. J Reconstr Microsurg. 2016;32(1):34-41. 21. Huang GK, Hu RQ, Liu ZZ, Shen YL, Lan TD, Pan GP. Microlymphaticovenous anastomosis in the treatment of lower limb obstructive lymphedema: analysis of 91 cases. Plast Reconstr Surg. 1985;76:671-685. 22. 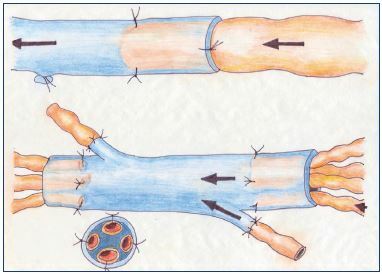 Jamal S. Lymphovenous anastomosis in filarial lymphedema. Lymphology. 1981;14(2):64-68. 23. Koshima I, Inagawa K, Urushibara K, Moriguchi T. Supermicrosurgical lymphaticovenular anastomosis for the treatment of lymphedema in the upper extremities. J Reconstr Microsurg. 2000;16(6):437-442. 24. Narushima M, Mihara M, Yamamoto Y, et al. The intravascular stenting method for treatment of extremity lymphedema with multiconfiguration lymphaticovenous anastomoses. Plast Reconstr Surg. 2010;125(3):935-943. 25. Yamamoto T, Narushima M, Kikuchi K, et al. Lambda-shaped anastomosis with intravascular stenting method for safe and effective lymphaticovenular anastomosis. Plast Reconstr Surg. 2011;127(5):1987-1992. 26. Yamamoto T, Yoshimatsu H, Narushima M, et al. Sequential anastomosis for lymphatic supermicrosurgery: multiple lymphaticovenular anastomoses on 1 venule. Ann Plast Surg. 2014;73(1):46-49. 27. Boccardo F, Fulcheri E, Villa G, et al. Lymphatic microsurgery to treat lymphedema: techniques and indications for better results. Ann Plast Surg. 2013;71(2):191-195. 28. Maegawa J, Mikami T, Yamamoto Y, Hirotomi K, Kobayashi S. Lymphaticovenous shunt for the treatment of chylous reflux by subcutaneous vein grafts with valves between megalymphatics and the great saphenous vein: a case report. Microsurgery. 2010;30(7):553-556. 29. Chang DW, Suami H, Skoracki R. A prospective analysis of 100 consecutive lymphovenous bypass cases for treatment of extremity lymphedema. Plast Reconstr Surg. 2013;132(5):1305-1314. 30. Becker C, Piquilloud G, Lee BB. Lymph nodes transplantation. In: Lee BB, Rockson SG, eds. Lymphedema: A Concise Compendium of Theory and Practice. 2nd Ed. Springer International Publishing AG 2011; 2018:369-380. 31. Akita S, Mitsukawa N, Kuriyama M, et al. Comparison of vascularized supraclavicular lymph node transfer and lymphaticovenular anastomosis for advanced stage lower extremity lymphedema. Ann Plast Surg. 2015;74(5):573-579. 32. Becker C, Hidden G. Transfer of free lymphatic flaps. Microsurgery and anatomical study [article in French]. J Mal Vasc. 1988;13(2):119-122. 33. Saaristo AM, Niemi TS, Viitanen TP, Tervala TV, Hartiala P, Suominen EA. Microvascular breast reconstruction and lymph node transfer for postmastectomy lymphedema patients. Ann Surg. 2012;255(3):468-473. 34. Lee BB, Laredo J, Neville R. Current status of lymphatic reconstructive surgery for chronic lymphedema: it is still an uphill battle! Int J Angiol. 2011;20(2):73-79. 35. Gloviczki P. Principles of surgical treatment of chronic lymphoedema. Int Angiol. 1999;18(1):42-46. 36. Becker C, Hidden G, Godart S, Maurage H, Pecking A. Free lymphatic transplantation. Eur J Lymphol. 1991;6(2):75-80. 37. Becker C, Hidden G, Pecking A, et al. Transplantation of lymph nodes: an alternative method for the treatment of lymphedema. Progress in Lymphology. 1990;XI:487-493. 38. Lee BB, Kim YW, Seo JM, et al. Current concepts in lymphatic malformation (LM). Vasc Endovascular Surg. 2005;39(1):67- 81. 39. Lee BB. Lymphedema-angiodysplasia syndrome: a prodigal form of lymphatic malformation. Phlebolymphology. 2005;47:324-332. 40. Guidelines 6.4.0. on medical and physical therapy. In: Gloviczki P, ed. Handbook of Venous Disorders: Guidelines of the American Venous Forum. 3rd Edition. London, UK: Hodder Arnold; 2009:663. 41. Lee BB, Laredo J, Neville R. Current dilemma with controversy. In: Lee BB, Bergan J, Rockson SG, eds. Lymphedema: A Concise Compendium of Theory and Practice. 1st edition. London, UK: Springer-Verlag; 2011:381-386. 42. Babb RR, Spittell JA Jr, Martin WJ, Schirger A. Prophylaxis of recurrent lymphangitis complicating lymphedema. JAMA. 1966;195(10):871-873. 43. Campisi C, Boccardo F, Campisi CC, Ryan M. Reconstructive microsurgery for lymphedema: while the early bird catches the worm, the late riser still benefits. J Am Coll Surg. 2013;216(3):506-507. 44. Lee BB, Antignani PL, Baroncelli TA, et al. IUA-ISVI consensus for diagnosis guideline of chronic lymphedema of the limbs. Int Angiol. 2015;34(4):311-332. 45. Lee BB, Villavicencio JL: Primary lymphedema and lymphatic malformation: are they the two sides of the same coin? Eur J Vasc Endovasc Surg. 2010;39(5):646-653. 46. Lee BB, Laredo J. Pathophysiology of primary lymphedema. In: Neligan PC, Piller NB, Masia J, eds. Complete Medical and Surgical Management. Boca Raton, FL: CRC Press; 2016:177-188. 47. Lee BB, Laredo J, Neville R: Primary lymphedema as a truncular lymphatic malformation. In: Lee BB, Bergan J, Rockson SG, eds. Lymphedema: A Concise Compendium of Theory and Practice. 1st edition. London, UK: Springer-Verlag; 2011:419-426. 48. Papendieck CM. Lymphangiomatosis and dermoepidermal disturbances of lymphangioadenodysplasias. Lymphology. 2002;35:478-485. 49. Campisi C, Boccardo F. Microsurgical techniques for lymphedema treatment: derivative lymphatic-venous microsurgery. World J Surg. 2004;28(6):609-613. 50. Papendieck CM. Lymphatic dysplasia in pediatrics. A new classification. Int Angiol. 1999;18(1):6-9. 51. Torrisi JS, Joseph WJ, Ghanta S, et al. Lymphaticovenous bypass decreases pathologic skin changes in upper extremity breast cancer-related lymphedema. Lymphat Res Biol. 2015;13(1):46-53. 52. Chang DW, Suami H, Skoracki R. A prospective analysis of 100 consecutive lymphovenous bypass cases for treatment of extremity lymphedema. Plast Reconstr Surg. 2013;132(5):1305-1314. 53. Yamamoto T, Yoshimatsu H, Yamamoto N, Yokoyama A, Numahata T, Koshima I. Multisite lymphaticovenular anastomosis using vein graft for uterine cancerrelated lymphedema after pelvic lymphadenectomy. Vasc Endovasc Surg. 2015;49(7):195-200. 54. Maegawa J, Mikami T, Yamamoto Y, Hirotomi K, Kobayashi S. Lymphaticovenous shunt for the treatment of chylous reflux by subcutaneous vein grafts with valves between megalymphatics and the great saphenous vein: a case report. Microsurgery. 2010;30(7):553-556. 55. Noel AA, Gloviczki P, Bender CE, Whitley D, Stanson AW, Deschamps C. Treatment of symptomatic primary chylous disorders. J Vasc Surg. 2001;34(5):785-791. 56. Basta MN, Gao LL, Wu LC. Operative treatment of peripheral lymphedema: a systematic meta-analysis of the efficacy and safety of lymphovenous microsurgery and tissue transplantation. Plast Reconstr Surg. 2014;133(4):905-913. 57. Baumeister RGH. Lymphedema: surgical treatment. In: Cronenwett JL, Johnston KW, eds. Rutherfod’s Vascular Surgery. 8th edition. Philadelphia, PA, USA: Sauders; 2014:1028-1042. 58. Silva AK, Chang DW. Vascularized lymph node transfer and lymphovenous bypass: novel treatment strategies for symptomatic lymphedema. J Surg Oncol. 2016;113(8):932-939. 59. Baumeister RG, Frick A. Die mikrochirurgische Lymphgefäßtransplantation. Handchir Mikrochir Plast Chir. 2003;35(4):202- 209. 60. Weiss M, Baumeister RGH, Hahn K. Posttherapeutic lymphedema: scintigraphy before and after autologous lymph vessel transplantation: 8 years of long-term follow-up. Clin Nucl Med. 2002;27(11):788-792. 61. Raju A, Chang DW. Vascularized lymph node transfer for treatment of lymphedema: a comprehensive literature review. Ann Surg. 2015;261(5):1013- 1023. 62. Becker C, Assouad J, Riquet M, Hidden G. Postmastectomy lymphedema: longterm results following microsurgical lymph node transplantation. Ann Surg. 2006;243(5):313-315. 63. Patel KM, Lin CY, Cheng MH. A prospective evaluation of lymphedemaspecific quality-of-life outcomes following vascularized lymph node transfer. Ann Surg Oncol. 2015;22(7):2424-2430. 64. International Society of Lymphology. The diagnosis and treatment of peripheral lymphedema: 2013 consensus document of the International Society of Lymphology. Lymphology. 2013;46:1-11. 65. Huang JJ, Gardenier JC, Hespe GE, et al. Lymph node transplantation decreases swelling and restores immune responses in a transgenic model of lymphedema. PLoS One. 2016;11(12):e0168259. 66. Lähteenvuo M, Honkonen K, Tervala T, et al. Growth factor therapy and autologous lymph node transfer in lymphedema. Circulation. 2011;123(6):613-620. 67. Brorson H. Liposuction in lymphedema treatment. J Reconstr Microsurg. 2016;32:56-65. 68. Lee BB, Kim YW, Kim DI, Hwang JH, Laredo J, Neville R. Supplemental surgical treatment to end stage (stage IV-V) of chronic lymphedema. Int Angiol. 2008;27(5):389-395. 69. Kim DI, Lee BB, Huh S, Lee SJ, Hwang JH, Kim YI. Excision of subcutaneous tissue and deep muscle fascia for advanced lymphedema. Lymphology. 1998;31(4):190-194. 70. Huh SH, Kim DI, Hwang JH, Lee BB. Excisional surgery in chronic advanced lymphedema. Surg Today. 2003;34:434- 435. 71. Rockson SG, Miller LT, Senie R, et al. American Cancer Society Lymphedema Workshop. Workgroup III: diagnosis and management of lymphedema. Cancer. 1998;83(12):2882-2885. 72. Auchincloss H. New operation for elephantiasis. PR J Public Health Trop Med. 1930;6:149-152. 73. Homans J. The treatment of elephantiasis of the legs – a preliminary report. N Engl J Med. 1936;215(24):1099-1103. 74. Brorson H, Svensson H. Liposuction combined with controlled compression therapy reduces arm lymphedema more effectively than controlled compression therapy alone. Plast Reconstr Surg. 1998;102(4):1058-1067. 75. Dellon AL, Hoopes JE. The Charles procedure for primary lymphedema. Long-term clinical results. Plast Reconstr Surg. 1977;60:589-595. 76. Sistrunk WE. Further experiences with the Kondoléon operation for elephantiasis. JAMA. 1918;71(10):800-806. 77. Kinmonth JB, Patrick JH, Chilvers AS. Comments on operations for lower limb lymphedema. Lymphology. 1975;8(2):56- 61. 78. Lee BB, Laredo J, Neville R. Contemporary indication and controversy on excisional surgery. In: Lee BB, Bergan J, Rockson SG, eds. Lymphedema: A Concise Compendium of Theory and Practice. 1st edition. London, UK: Springer-Verlag; 2011:403-408. 79. Brorson H, Svensson H, Norrgren K, Thorsson O. Liposuction reduces arm lymphedema without significantly altering the already impaired lymph transport. Lymphology. 1998;31(4):156-172. 80. Brorson H. From lymph to fat: complete reduction of lymphoedema. Phlebology. 2010;25(suppl 1):52-63. 81. Brorson H, Ohlin K, Olsson G, Karlsson MK. Breast cancer-related chronic arm lymphedema is associated with excess adipose and muscle tissue. Lymphat Res Biol. 2009;7(1):3-10. 82. Brorson H. Liposuction in arm lymphedema treatment. Scand J Surg. 2003;92(4):287-295. 83. Lee BB, Laredo J, Lee TS, Huh S, Neville R. Terminology and classification of congenital vascular malformations. Phlebology. 2007;22(6):249-252. 84. Lee BB, Laredo J, Kim YW, Neville R. Congenital vascular malformations: general treatment principles. Phlebology. 2007;22(6):258-263. 85. Lee BB. All congenital vascular malformations should belong to one of two types: “truncular” or “extratruncular”, as different as apples and oranges! Phlebol Rev. 2015;23(1):1-3. 86. Lee BB, Laredo J, Neville R, Mattassi R. Primary lymphedema and Klippel- Trenaunay syndrome. In: Lee BB, Bergan J, Rockson SG, eds. Lymphedema: A Concise Compendium of Theory and Practice. 1st edition. London, UK: Springer-Verlag; 2011: 427-436. 87. Frick A, Hoffmann JN, Baumeister RG, Putz R. Liposuction technique and lymphatic lesions in lower legs: anatomic study to reduce risks. Plast Reconstr Surg. 1999;103(7):1868-1873. 88. Brorson H, Ohlin K, Olsson G, Långström G, Wiklund I, Svensson H. Quality of life following liposuction and conservative treatment of arm lymphedema. Lymphology. 2006;39(1):8-25. 89. Hoffner M, Bagheri S, Hansson E, Manjer J, Troëng T, Brorson H. SF-36 shows increased quality of life following complete reduction of postmastectomy lymphedema with liposuction. Lymphat Res Biol. 2017;15(1):87-98. 90. Lee D, Piller N, Hoffner M, Manjer J, Brorson H. Liposuction of postmastectomy arm lymphedema decreases the incidence of erysipelas. Lymphology. 2016;49(2):85-92.